I am watching some Utube videos of how to unload and load dry. Unload no problem but there are a couple ways shown for loading. 1 Getting a running start and maintaining alignment 2 backing the trainer up and rolling the bow up far enuf then starting the motor to finish the load. Just curious how veterans do it! Thanks for any input, 14 ft alumitec with ploy, 355 cu in with kaway. Im not sure about the running start unless your on pretty smooth ground. I usually just nose the boat up to the back of the trailer then give it a little gas. You have to careful not give it to much once they are up on the trailer they will slide pretty easy and you will be in the back of your truck. Need to get used to and comfortable with dry running before you try dry loading. More than one boat has been parked in the back of the tow truck. I just drove to the trailer and right on up on it then stopped just before I hit the bow stop on the trailer. Give it bump from the throttle to put the nose on the bow stop and I'm done. Its a learned skill same as with nearly everything else with an airboat. Approach it with caution. 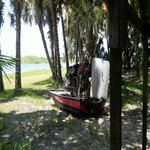 the hardest part is knowing how to get the boat lined up right and getting the front end to pop up on the trailer without deadheading against the rollers and stopping. once you get used to that it's no problem. i've pushed my truck across the parking lot a few times when loaded down real heavy and not getting the front end to pop up on the trailer. like mentioned above approach the trailer with just enough power to keep moving so if your not aligned you can always stop to realign the trailer if needed and once within a few feet apply enough power to climb the trailer. once half way on trailer the boat will move much easier than on the ground so be careful to get comfortable with running the boat on dry before attempting a dry load. I always drive up to the trailer and unload all passengers and have them move up beside the vehicle before I load that way they don't have to jump down from the trailer and it get you used to double checking that nothing has been placed on the trailer while you were out. then approach the process slowly until you get the hang of it. little advise flat surfaces are a huge help when dry loading so if you have to park the trailer in weird angles then I prefer to set the trailer on a more level spot otherwise the boat will try to move to the lower side of the trailer making it more difficult. but all will be learned in time. leave the pin in for loading. All good tips thanks. I see it takes time and practice but advice from veterans sure makes it easier to understand. I'm liking getting alignment right, relatively flat surfaces and inching up to bump up and on. I even used a 5 foot piece of land scape timber 4 ft away from the trailer to assist the bow lift. I recon a few simple loads then some more difficult situations will be easier to manage. Thank ya'll for the advice. Not all trailers are set up to dry load. If your trailer is set up right, and you have enough power, there are no questions needing to be asked. It will drive right up. If not, how other people do it doesn't matter. You don't have their boat or trailer. An experienced driver can often get a boat on a trailer that really shouldn't be dry loaded, but from what I have seen, when people have trouble dry loading, usually the trailer is set up wrong or the boat is underpowered. There needs to be solid guides on both sides, soft enough leaf springs, a good roller or angled board at the end, and that roller or board needs to be low enough to the ground. If set that way, you can load a 350DD reasonably. If not, I have seen good running 0-540 boats and strong V8 reduced boats have trouble. What have you found to be the best way to dry launch? A tilt trailer really helps. Also having a car motor helps. Don"t have to worry about getting stuck as much. mojoe wrote: Not all trailers are set up to dry load. I agree 100% with Mojoe, not all trailers are set up for dry loading. I have a carpeted dovetail on mine, but no roller. I can dryload it fine, but a roller would be helpfull. My Son's boat (383 direct drive) has a tilt trailer, he almost always dry loads/unloads with zero issues. His trailer also has a poly covered dovetail with a roller.